It’s about a week and a half until the wedding and we’re getting down to the wire. The last thing on my list was to break in the wedding shoes. As “Mother of the Bride” finding an outfit and shoes was a traumatic event. I hate shopping, really, really hate shopping! I know, I’m like the anti-woman. But I digress. I began the hunt for a suitable frock several months ago. I learned my lesson about waiting at the time of my other daughter’s wedding. I was lucky, I found a beautiful dark blue gown with some silver beading at Nordstroms on-line. I know right?! I’ve never shopped there before and I was pleasantly surprised. I placed the order and waited with bated breath to see if it would fit. It arrived after two days, I threw open the box, pulled it out and it was perfect. Okay it needed to be hemmed, no biggie, in my reality everything gets hemmed. Or… I could get a pair of six inch heels? That’s what my daughters would do. I almost did it. I was tempted. Everyone looks better in heels right? Until you fall and break your neck! But the great shoe search was fruitless. I couldn’t find anything I liked, not with a six inch heel or a two inch heel. Nothing that would go with the dress and not assist in my death. After listening to my tale of woe, my daughter, the shoe maven, suggested Zappos.com . 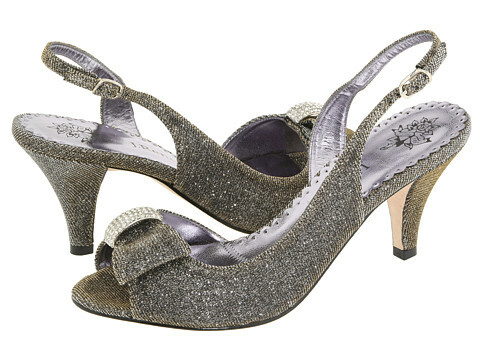 After searching through what seemed like millions of pairs of shoes, I found these shoes by J. Renee. They are a pewter colored fabric and look great with the dress. Even better, they are just high enough that I didn’t have to get the gown hemmed, but not so high that I should be able to walk around in them. The shoe gods were smiling down on me for sure. So everything is good, right? Well sort of, I still have to break the shoes in so I don’t break something. I have to say, I’m grateful to Jackie, the shoe maven, for pointing me towards Zappos, and I’m very happy that they are actually comfortable as well as beautiful. Maybe I won’t have to take them off after the cocktail hour. Yay!I’d love to hear any comments you have about your wedding/pre-wedding experiences! So happy I could help! They are so pretty!! All hail to the shoe maven! 🙂 I couldn’t have found them without you! Your shoes are beautiful! I can’t wait to hear all about the big day. Thanks, Kim! I am so excited for her and it will be wonderful to have a new son to welcome in to the family. Your shoes look gorgeous. I’m sure you’re going to look beautiful.